Tuile templates are expensive for what they are – here’s how you can easily make your own for nothing. 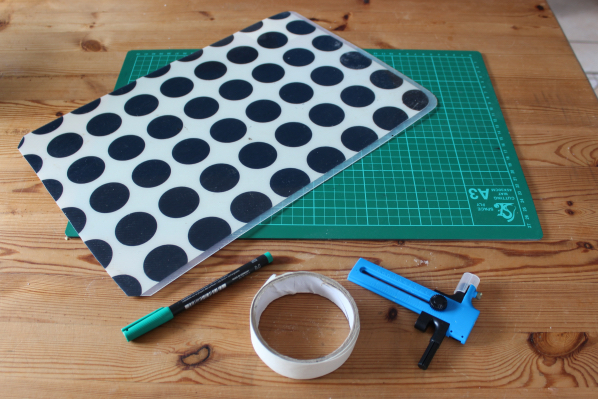 All you need is an old plastic table mat (or the top of an ice cream tub or similar) and to use either a pair of sharp scissors or a craft circle cutting tool. I’ve shown you a circle template here, but you can go on to create lots of different shapes: triangles, flowers, fruit, stars. Anything you can think of really! First of all, if you are using a place mat or other large piece of plastic, cut the item down to fit into your baking sheet. There’s no point doing this if you then can’t lay the thing flat on your bake sheet! Fold the circle of card in half, then half again (so it is a quarter circle) to find the centre. Use this to work out roughly how many circles you can get out of your plastic. 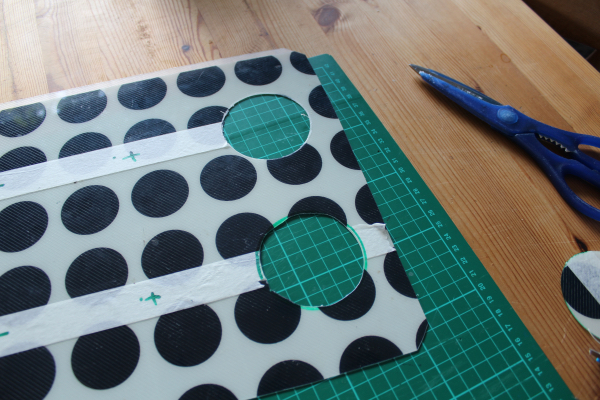 You’ll need to leave at least a 1.5cm / almost 1″ gap between each circle. For a piece of plastic that covers an entire baking sheet I’d expect you to be able to fit in about eight circles and for a tub lid, about four. 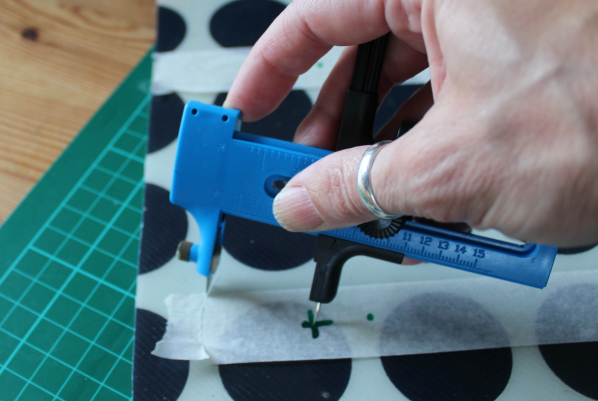 Put two strips of masking tape down the plastic where the centre points of the circles will be – this will help you mark the centres and to stop either the cutter or scissors slipping. Mark out where the centre point of each circle will be – use that piece of card you cut into a circle to make sure you leave enough gap between each tuile shape to make them evenly spaced and to ensure you haven’t put them too close to the edge or each other. If you’re using the cutter, put the blade to the right distance (remember it marks the radius not the diameter, so if you’re doing a 7cm tuile, set it at 3.5cm). Put the compass point on the centre mark and slowly and gently turn the cutter – it might be easier to keep the cutter static and turn the plastic. Better to make many gentle turns than try to cut out the circle with force quickly as this can distort the shape you at cutting out. If you are using scissors, you will need to mark the outline of each circle around the card, so you have a shape to cut to. Mark out all the circles. Carefully jab a hole in the centre of a circle being sure not to stab yourself! Cut towards the edge and then go round the inside of the line. Tidy up if need be. 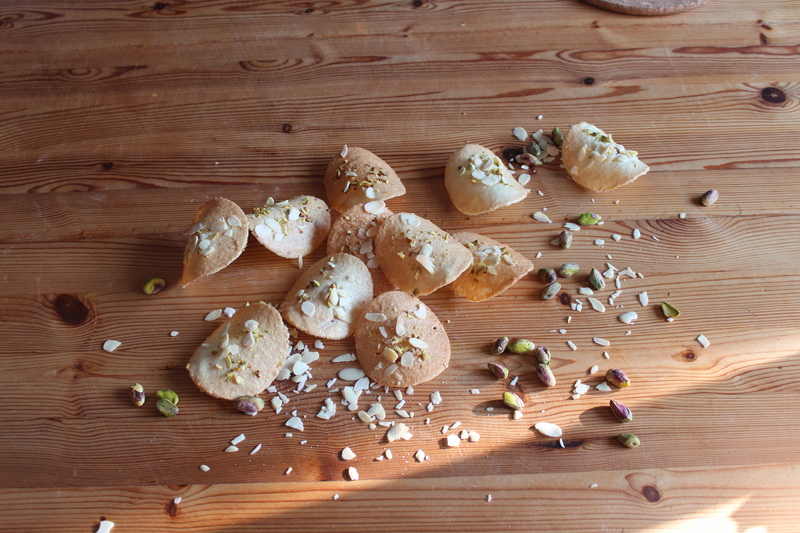 Whatever method you are using, repeat until you have all the tuile shapes cut out. 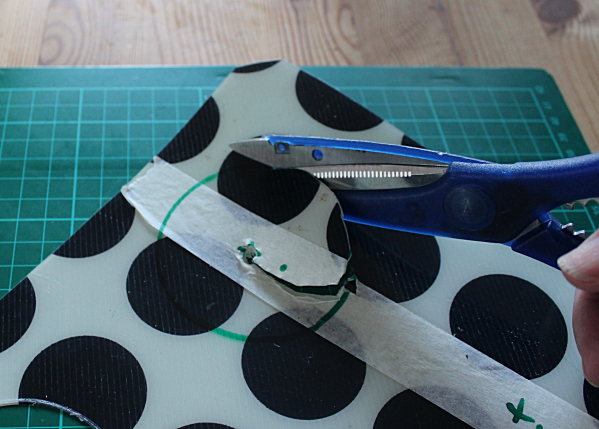 If you want to go on and make other more unusual shapes, you need to use the scissors method or use a craft knife. Thoroughly wash the template before use but it should last you a long time. It popped up when I did an online search for templates, actually. Your SEO is doing a good job!